Hope this is useful. I want to be able to serve up videos without the dependency on Youtube or other restricted US-based sites. Firefox and HTML5 .mp4 Video rendering. To get HTML5 (and Adobe Flash) video to work, if you have older (but stable and fast) 32-bit machine, running CentOS 6.6, you probably want to upgrade to Firefox 60.2.1, via a "yum" or "dnf" (the new-and-improved? version of yum). The key problem with doing this, is that Firefox 60.2.1 (the one that you get if you say "yum upgrade firefox" on CentOS 6.6), will probably crash if you try to import bookmarks. And if you have your old bookmarks, they will *not* be transfered from your older Firefox to the new one. (Why the folks writing Firefox cannot make bookmarks work right, looks to be due to their desire to force your bookmarking activity onto some alternate approach, like a cloud-service. Perhaps the idea is to create a revenue stream?) Whatever the reason, bookmarks are almost *always* broken on Firefox it seems. Since even attempting to import an .html file of plain bookmarks in Firefox 60 will crash Firefox (see below), you will need to use some trickery to get your old bookmarks into the new Firefox 60.2.1. The reason for using Firefox 60 is that the video can be made to work, on Linux, which is useful. Note: Again, you will likely need Adobe Flash, but it is not difficult to install on Linux. Here are my notes on getting Firefox 60.2.1 to load your bookmarks. to import .html bookmarks, as this would cause Firefox to crash. from the previous Firefox (which was Firefox 34), resulted in no action. files, and then importing the bookmarkbackups-generated .html file. *can* be successfully imported into Firefox 60.2.1. I had roughly 1200 bookmarks, so this utility was a lifesaver. hidden directory, because of the "." character in front of the name. you attempt to update to Firefox 60). The subdirectory "bookmarkbackups"
created when you use the "export bookmarks to .html file" option. It is called: "Bookmark Backup Reader/Decompressor for Firefox". 3) Then list the binary ".jsonlz4" files in a desktop window using "Files"
"Accessories". When "Files" starts, it will show your home directory. that box, and you will see ".mozilla" directory. (The hidden ".yattayatta"
test fill the webpage window). Firefox do with this file? ", click the button that says: "Save file". which should be in your /home/<userid>/ directory. which is probably the correct thing to do. restore the bookmarkbackups bookmarks into Firefox-60.2.1 ESR. Hope this helps anyone else in a similar situation. I run a version of Firefox that does not have .mp4 video rendering, and to make it work on my older WinXP/SP3 box, with both Flash and HTML5, I followed the instructions on this site, and they worked well. As the test pages montage above show, I can render all common/popular video formats now. Hope this is useful. I'm experimenting with verison 55.0.2 version of Firefox, but as the Mozilla folks have decided to drop support for all plugins, and are also taking a heavy-handed approach (again) at logging all one's web activity (the "Top Sites" stuff is back, and cannot be disabled in newer FF versions, apparently), I am remaining with this older version for now. I can confirm that Firefox version 55.0.2 (most current production Firefox, as of Sept. 14, 2017 from Google Play Store) with Android 6.0.1 on Samsung Tab-A (most current Andriod that Samsung official makes available for the device) works with the Android Flash drivers version 11.1.115.81, which are indicated on the Adobe documentation as only working on Android 4.0 (I don't know what sugar candy version this is ... Ice Cream Toad?). The Flash Video archives from Adobe are at the url below. You can find the Android Flash Ver 11.1.115.81 about 3/4 ers of the way down the page. To download and install, make sure you fiddle the "Settings" in Android so that you can install .apk files (Android Package Files) from a non-certified source. 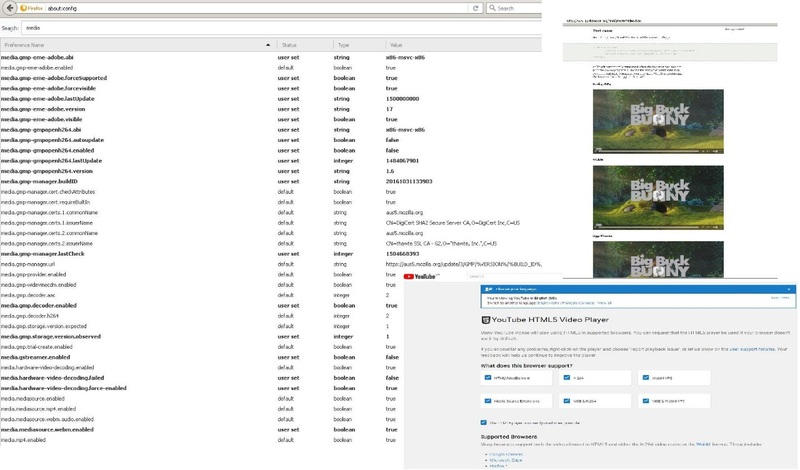 Detailed image-capture of info to configure Firefox to render H.264 (mp4) videos (eg. modern Youtube, as of Oct. 2017), correctly. Test your Youtube rendering with the page "https://www.youtube.com/html5". Once you get Firefox and the Primetime plugin from Adobe working right, you should see checkmarks in all 6 boxers on the Youtube HTML5 test screen. 2) Put the zip file somewhere, and run a SHA256 check against it to confirm the hash-code that is provided on the video image. It should start with 80975242 and end with BAB11395. Unzip the downloaded file "primetime_gmp_win_x86_gmc_40673" and you should get three files, which are called: eme-adobe.dll, eme-adobe.info, and eme-adobe.voucher. These three files will have to be put into the right subdirectory in your Firefox Profile directory. 3) Install the plugin manually: Start your Firefox, and look for where your "Profile" directory is located. Enter "about:support" in the url box, and then, in the section called "Application Basics" click on the button beside "Profile Folder" that says: "Show Profile". That is your profile directory. 4) In your Firefox profile directory, where the plugins are located, create a directory called "gmp-eme-adobe". Go into that directory, and create a sub-directory called "17",and then navigate into that "17" directory you just created. 5) Put the three files from the zip file into this new "17" subdirectory. That's it. You can exit the directory stuff, and in the Firefox URL box, enter: "about:config", to change the Firefox operational control parameters. Click thru the "I'll be careful..." warning. Make sure to be careful, eh? 6) Enter "media" in the search box, to display all the "media.<blahblahblah...>" parameters. You will have to examine the "media.gmp...." parms shown in the screen below, and make sure your Firefox parms match these shown on that screen. You need to BE ACCURATE. Some parms are booleans, some are integers and some are strings. In all cases, these terms are CASE SENSITIVE. That means "media.gmp-yattayatta" is NOT THE SAME AS "media.gmp-yattaYatta". Why these fine fellows mix case randomly is beyond me, but just deal with it. Again, hope this helps. I have spent *way* too much time on this video stuff, even building Mplayer and GMplayer from source, for my Linux boxes - and yes, got it working very nicely, in hi-res video and audio. (I'll doc what I did in detail to get it working right at some point.) I run the audio thru an old Denon amp that has a transformer the size of a small car-battery, and push it out thru 35 year old Ortofon 445 speakers that apparently were made in Denmark. It all finally looks and sounds somewhat OK. Problem is that any interesting video has to be downloaded, as youtube stops and starts with interuptions far too often. It is sometimes unwatchable, but at least we are not using satellite, which other folks tell me is even worse in bad weather, than our poor Wimax service. Image capture of the msfn site page that explains how to manually install the "Primetime" plugin from Adobe that lets H.264 (ie. mp4 rendering) work on Firefox-47. Installing this plugin into your Firefox plugins directly correctly on a Windows box, will make Firefox render H.264 (ie. mp4) videos. This will let Youtube work again, if you find is has been broken by the July 2017 decision to disable Youtube Flash support. Understand: Youtube is no longer offering videos using Flash. Nothing installed locally on your machine will force Youtube to offer Adobe Flash videos, despite all the disinfo on Youtube and in the useless Firefox plugins. Youtube is no longer transmitting anything using Flash. You must convert to HTML5 options. 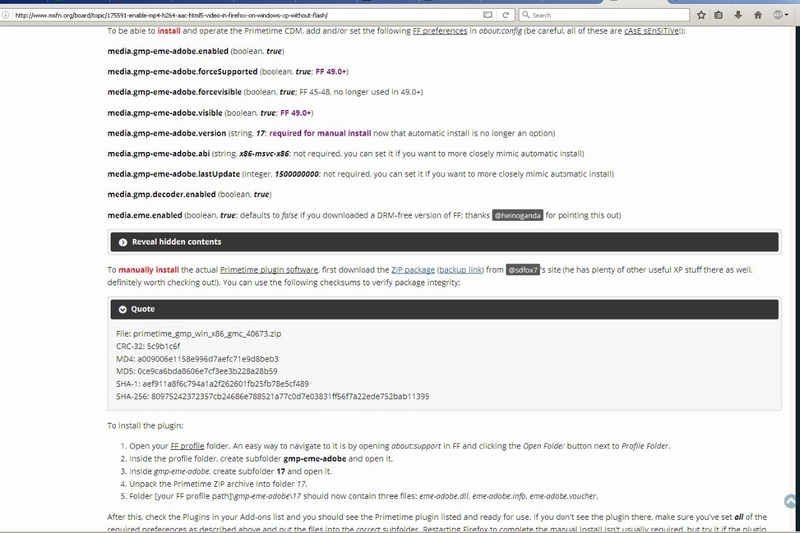 Use the Youtube test page to see if you have configured your browser correctly to render HTML5. The url for the test page is: "https://www.youtube.com/html5". Hope this helps.